Some of the thickest Arctic sea ice has begun breaking up, revealing open sea that is typically always frozen, indicating that Arctic ice may even more vulnerable to global warming than previously thought. Meanwhile, the Trump administration has announced new rollbacks on power plant pollution regulations. Before 2018, scientists at the Norwegian Ice Service had never recorded the sea ice north of Greenland breaking up in summer; it's already happened twice this year. This zone, typically referred to as "the last ice area," was assumed to be the place most reliably frozen year-round and thus would form the last bastion of Arctic ice against the warming weather of climate change. ​"Almost all of the ice to the north of Greenland is quite shattered and broken up and therefore more mobile," Ruth Mottram, of the Danish Meteorological Institute, told The Guardian Tuesday. An abnormal temperature spike in February, followed by another earlier this month, have left the ice vulnerable to breakup by wind and tide. Once it moves away from the shore, it can more easily melt and break up. Walt Meier, a senior research scientist at the US National Snow and Ice Data Center, told The Guardian that "the thinning is reaching even the coldest part of the Arctic with the thickest ice. So it's a pretty dramatic indication of the transformation of the Arctic sea ice and Arctic climate." Meier noted that the pack ice there is typically "over four meters thick and can be piled up into ridges 20 meters thick or more. This thick, compacted ice is generally not easily moved around. However, that was not the case this past winter and now. The ice is being pushed away from the coast by the winds." ​Thomas Lavergne, a scientist at the Norwegian Meteorological Institute, told the Guardian for an article published August 21, "I cannot tell how long this open water patch will remain open, but even if it closes in few days from now, the harm will be done: the thick old sea ice will have been pushed away from the coast, to an area where it will melt more easily." ​"One of the problems with the melting of the Arctic ice is that there is a feedback loop with the darker open water absorbing more radiation and warming the Arctic waters more rapidly as there is less sea ice," Fred Magdoff, emeritus professor of plant and soil science at the University of Vermont, told Sputnik Tuesday. "That the thickest ice is breaking up is ominous, because it means that the whole process may be happening quicker than scientists predicted." "The warming of the Arctic is happening faster than the warming in the lower latitudes, and the greater difference in temperatures (north to south) is part of the explanation for the persistent weather patterns we've been experiencing. They tend to move more slowly, causing more severe dry conditions and longer wet conditions," Magdoff noted. 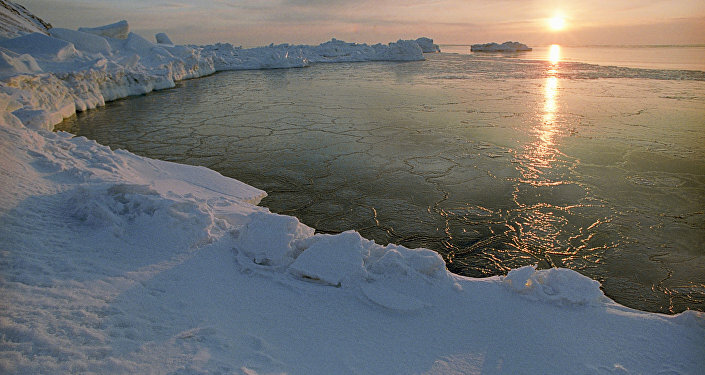 Altogether, the trend is in line with predictions that there will no longer be summer ice in the Arctic Ocean beginning sometime between 2030 and 2050. ​The Environmental Protection Agency (EPA) released on Tuesday what it touts as the Affordable Clean Energy (ACE) proposal, a plan to replace Obama-era legislation aimed at reducing power plant greenhouse gas emissions with much lower standards that will ostensibly help the coal industry but essentially nullify all reduction targets, Vox noted. In 2015, the administration of then-US President Barack Obama implemented the Clean Power Plan (CPP), which would have reduced US greenhouse gas emissions by 32 percent compared to 2005 levels by 2030, but when 24 states sued the administration, a judge put a stay on the CPP to allow the lawsuits to proceed. ​When Trump took office, he signed an executive order to start rolling back emissions regulations across the board on the spurious grounds that they were responsible for lagging economic performance by heavy industries. The ACE, the legal component to actually replace the CPP, is projected to only decrease emissions between 0.7 and 1.5 percent by 2030, something that the EPA admits will cause upwards of 1,400 additional premature deaths per year, the New York Times reported Tuesday. Nonetheless, at a political rally in West Virginia Tuesday night, Trump told the crowd, "We've got the cleanest country in the planet right now."